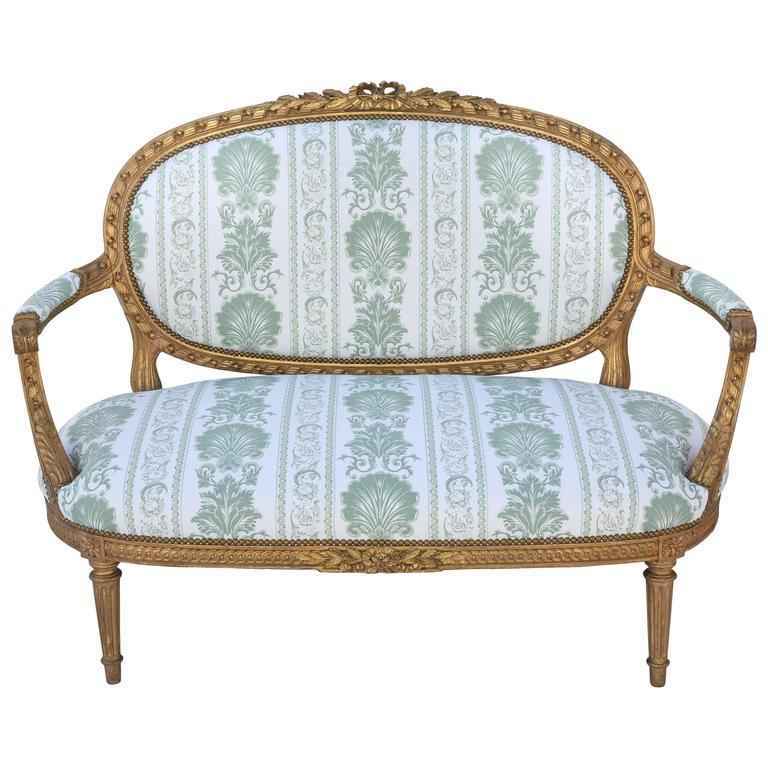 Fine giltwood settee, in the Louis XVI style, having an oval padded backrest in gadrooned frame, surmounted by a bow, flanked by laureling, its outswept arms with padded elbow rests, crown seat on, guilloche-carved seatrail, raised on round, fluted, tapering legs, ending in touipe feet. Upholstered Neoclassical printed linen, with nailheads. Seat Height: 18.5"
CONDITION: Excellent antique condition. Wear consistent with age and use. Newly upholstered; swatch available upon request. Fine giltwood settee, in the Louis XVI style, having an oval padded backrest in gadrooned frame, surmounted by a bow, flanked by laureling, its outswept arms with padded elbow rests, crown seat on, guilloche-carved seatrail, raised on round, fluted, tapering legs, ending in touipe feet. Upholstered Neoclassical printed linen, with nailheads. Seat Height: 18.5" CONDITION: Excellent antique condition. Wear consistent with age and use. Newly upholstered; swatch available upon request.